Basketball card collectors are treated with another look at the Elite Brand during the 12/13 NBA Season. 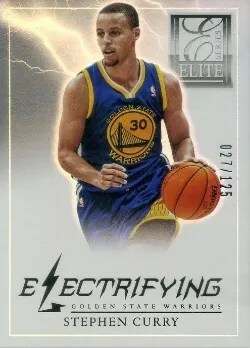 Panini released ‘regular’ Elite Basketball back on February 20, 2013 – and I guess you could say this is a more flashy version of that set. For $175 opening price on these boxes, and 4 autographs means your paying over $40 for each auto! Boxes better deliver some big names more often than not if I were to even consider buying one. NBA card collectors will have a tough time having any money left over from the paycheck or allowance when this set comes out because several Panini Basketball sets are being released right around the same time as this one. 2012/13 Panini Past & Present Basketball, 2012/13 Panini Momentum Basketball, and 2012/13 Panini Brilliance Basketball are all scheduled to be released within weeks of Elite Series! Many times releases are pushed back, however it might flood the market temporarily with lots of new cards … which may actually help keep the price down for singles and boxes.